Being such an easy plant to propagate, Iresine herbestii along with a few other species are very popular plants in warmer climates. 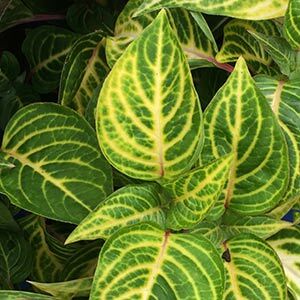 These plants are grown for the colorful foliage rather than the flowers, they have been in cultivation for nearly 200 years and in the past were used for mass plantings where the brilliant foliage was a display of opulence. A tropical to sub tropical plant Iresine is a small shrub from Brazil reaching around 1m in height. Grown for the foliage that in some varieties is a ‘Blood Red’ Iresene makes a great understory plant for a tropical garden. They are also widely grown in cooler climates as indoor plants. 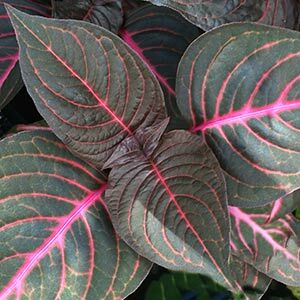 Iresine are often called Bloodleaf, or Beafsteak Plant, however green foliage varieties are also available. It is the cultivars that are most popular although some species are still commonly available. Although Iresine are reasonably drought tolerant, they do not actually perform that well and certainly the foliage will not be as brilliant without adequate moisture. Being originally from Brazil, although Iresine will grow in coastal areas as far south as Merimbula, they do best in warmer climates. Iresine are frost tender. Irisene are widely available in Garden Centres North of Sydney. Being a soft wooded perennial, Iresine cuttings strike easily. They do need humidity until the root system is established. Take cuttings around 10 cm. Look for stronger stems for best results. Cuttings can be soaked in a diluted household bleach for a few minutes to help eliminate pathogens. Uses sterilised pots and a free draining humus rich potting mix with some added perlite. After soaking, trim back the ends to remove the part where bleach may have entered the stem. Trim back the foliage by 2/3. Use a stick or dibbler to make holes in the potting mix and insert the stems into the potting mix. Water, mist and cover with either a plastic bag or clear plastic drink bottle. This acts as greenhouse and keeps the transpiration rate lower. Mist regularly until new growth is apparent.